On Saturday afternoon last a very interesting ceremony was performed in unveiling the Honor Roll erected in the Koloona hall. The chair was taken by Mr. G. A. Codrington, and the hall was crowded to the doors, while visitors from the surrounding districts were numerous. 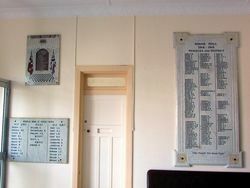 These included Mr. W. D. Capel (President of the Yallaroi Shire) Rev. Mr. Crane, Messrs. G. D. Martin, T. W. Spencer, H. Allison, B. S. May, A. Stewart, W V. Holtsbaum and Lieut. Francis, all of Warialda, the two latter being returned soldiers; also Mrs. May, Mrs. Stenmark, and Mrs. Francis. Visitors from Delungra were numerous. Returned soldiers from the locality present were Messrs. Goods (2), C. N. Kent, Troillet, Chambers, and F. Kitching. After the chairman had welcomed the visitors, Miss Hannah Kent played a pianoforte solo, "Peace on Earth," which was followed by the opening speech by Mr. W. D. Capel, who delivered a highly interesting address. 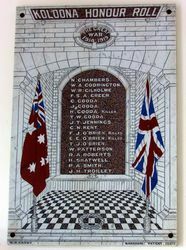 A number of children, under the direction of Mrs. Alfred Kent, then sang "Advance Australia," after which Mr. G. D. Martin, of the Warialda Public School, gave an eloquent address. The children then sang "Songs that Bind the Empire," after which the unveiling ceremony was performed by little Miss Connie O'Brien. Immediately, on the fall of the flag "God Save the King" was heartily and lustily sung by the audience, ending in three rousing cheers. Mr. J. Wason, of Delungra, then made a brief address, dwelling upon the great work done for the war by the mothers, wives, and sweethearts of the boys at the front. The next item was an exceedingly pretty one. Little Edna Rose, suitably attired with a dove of peace on her shoulder, advanced with a wreath to hang on the Roll in honor of the fallen heroes. As she knelt before the Roll, Miss Hannah Kent played "Remembrance." The parents of the fallen soldiers were not forgotten, as Mrs. Alfred Kent presented to each one a bouquet in honor of their heroic son. Each bouquet was tied with a ribbon of the respective battalion colors, suitably worded. The recipients were Mrs. C. O'Brien, and Mrs. O'Brien, sen. Prior to this Rev. Mr. Crane delivered a very feeling address appropriate to the occasion. The concluding item was the presentation by Mrs. Alfred Kent of the ribbons to tie up the flag, suitably inscribed, to the two little girls who had taken a prominent part in the day's proceedings, namely, Misses Connie O'Brien and Edna Rose. The National Anthem was then sung, after which all present were entertained at refreshments by the ladies of Koloona. 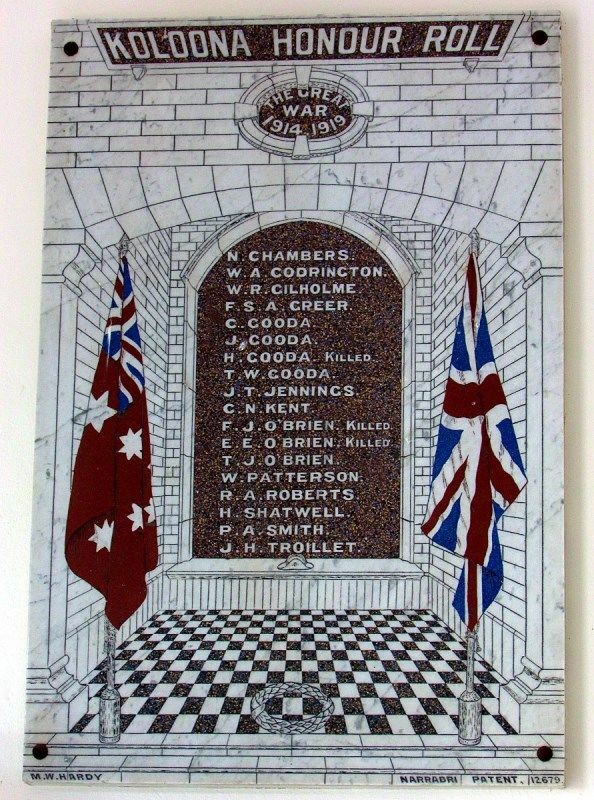 The Honor Roll is a highly creditable work of art, having been prepared by Mr. M. Hardy, monumental mason, of Narrabri. It is a marble slab, handsomely decorated with mosaic, the names being inlaid in most durable and attractive fashion, on a system specially devised by the operator himself. Inverell Times (NSW), 3 October 1919.